Hello! 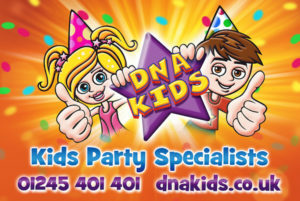 We are DNA Kids, the children’s favourite party entertainers! CALL US FOR A QUOTE! Our friendly party advisors love being helpful. For further information, quotes or bookings, please call us on 01245 401 401 or email hello@dnakids.co.uk. Visit our website here, follow us on facebook here. Hello My Name is Stuart, I am a Children’s Entertainer with a full Disco which includes the latest Disco Light’s, Laser Light’s and a Big Bubble Machine. All the music I play is age appropriate for children. My price for a two hour party is £120 but I can do any length of time, prices on request. On the day of the party, I arrive 45 minutes before the party starts giving me time to set my equipment up. When I’m ready, I get the children to do party dancing and high energy fun games and I give out prizes for the competitions. All the entertainment is done by me, leaving you HASSLE free during the party. I normally do one hour of entertainment then stop for food followed by Happy Birthday and more games and music until the party ends. The music is played low while the children eat. You can have a children’s Karaoke in with the price, just let me know when you book your party. When booking your party, I will send you confirmation giving you peace of mind and I will text you three days before your party as a courteous text to confirm everything is ok.
As well as children’s parties Leeds Disco provide entertainment at school and community events. Do you provide fantastic kids party entertainment? Are you a parent who can give a recommendation? Contact us to share the knowledge. If you’re looking for the best children’s entertainment in West Yorkshire, look no further! From marvellous character appearances to full on 2 hour parties with energetic and fun hosts, dancing, music and games. Leave it with us to bring that extra Dash of Wonder to your child’s special day. Find us on Facebook or call 07599 317106 for more information. Deano’s bouncy castle hire is a family run business that as being going for over 7 years. As parents ourselves, we know that children now want something a little more special for their birthdays. Hire bouncy castles, ball pools, indoor party toys, kids tables & chairs. Excellent customer service that you can rely on. Based in Ossett. Family-run business offering top quality equipment and inflatables, excellent customer service and good value for money. Our aim is to bring fun, laughter and smiles to your event! Mega Slides & Assault courses. Soft Play / Ball Pools. LT Entertainment is a West Yorkshire based entertainment supplier providing balloon modelling, magic and juggling. Bring fun and entertainment to your event, or learn the skills yourself, by booking an entertainment specialist. Parties, weddings, fun days and much more catered for. Contact us to discuss your requirements on 07429 400406. From balloon modelling, face painting and glitter tattoos, to full entertainment with music, lights, disco, karaoke, puppets, crafts, balloons, magic, themed fun and games with prizes at birthdays, christenings, weddings, house warming’s, fund raisers, gala’s, and more; I provide a full spectrum of entertainment to ensure your event is a colourful one! You can even have one of my characters come and host the party. Find me on Facebook, or call or Text Rebecca on 07929 271983. Children’s Entertainment with a variety of packages to choose from, Discos and dance parties, Bouncy Castle Hire & parties, Face Painting & balloon twisting. Plus a huge range of inflatable and soft play equipment to hire. Early booking advised. Special school disco rate available. Hire our indoor tents (plus mattresses, sheets, cushions, garlands, fairy lights and more!) to help make your child’s sleepover extra special. We have various themes available and optional party activities to choose from too. We set it all up for you. Get in touch when you have a sleepover to plan! Yorkshire Fun Hire is a family owned bouncy castle hire company based in Castleford. All their castles have public liability insurance and are insured for licensed premises. As well as castles, soft play areas and set ups are also available from Yorkshire Fun Hire. All services are indoor hires only.